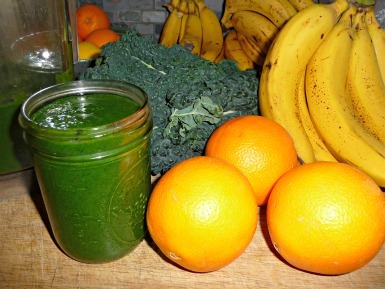 This is a simple basic green smoothie that you can enjoy as is or modify with your favorite fruits and greens to make the perfect smoothie for you. I myself could enjoy this one day after day for months on end…..lol. During the winter months I would add a chunk of fresh ginger, a small hot pepper, and perhaps some cinnamon as they are warming foods and will help keep one warm on the inside.